I had this pegged as an intriguing matchup. Well, he turned in 16 points and 11 assists tonight. I also looked at Isaiah Thomas’ second leading scorer DeJuan Wright. A week ago (when I last checked his stats) he was averaging 14.3 ppg, 7 rpg and 1 assist. More decency. The guy is 6’3″. He has a little size and can score. That is a nice little inside-outside combo they have there. DeJuan had 21 and 8. They made it a game all the way until late in the second half thanks to those two and some very shaky play by our guys. I had other commits at halftime so I had to rely on my man-on-the-scene and radio play-by-play to keep me up to date. I learned that jump-rope halftime shows are fantastic and that Tristan Thompson can score the basketball. I’ve said before that Tristan and Josh make this team go. 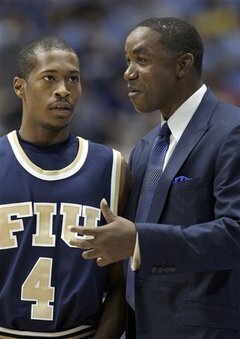 It was oh-so-evident late in the first half when FIU was leading by eight with 3 or so minutes to play. Tristan hadn’t played up to that point because of some poor practice habits or something. Vito calls it ‘stumbling and bumbling’ but I call it trying to play without one-half of your scoring duo. I don’t know for sure yet if Tristan or Josh is Batman or which one is Robin, (my buddy says that it is Tristan as Batman and if he is talking height then he has a case). I do know that without Tristan we were down eight and he came in and drained a trey, sparking the run that would put us in the lead at the half. He had 11 despite playing only 22 minutes. You can look at this game as Florida International playing well on the road against the best of the Sunbelt or you can look at this as North Texas playing a talented FIU team that hasn’t put it together yet playing without the leading scorer and having had a week off. I am a homer so I’ll vote for the second one. Time off does horrible things to your game. The good news is that Tristan and Josh once again carried the team with help. Big George was a monster last night and my man Kendrick Hogans put up ten, too. To be fair, Kendrick once again looked completely lost on offense. I swear Dominique Johnson was screaming at him to get to the low post where he was supposed to be on one possession. So Hogans drifts over to his spot, catches the pass, gets it out to GO for a jumper. Dude knocks it down. Everyone is happy. I want to be happy for stuff like that but I can’t help but think how that will effect us later. I’ll leave you with that last cynical note. Next: Next post: Troy 89 North Texas 81: WTF?